. : In English part 9 :. 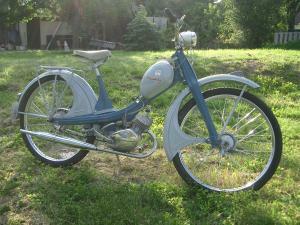 I once owned a moped like the one on the picture. I was 18-19 years. It was a NSU Quickly. I bought it for two reasons. Every day I had to cover a distance totaling 2-3 miles to and from college. I found it only fair that I was motorized. Secondly I earned a little money by helping The Silkeborg Craftsmen's Association. Once every month I had to pay a visit to all members to make them pay their monthly fee. In the beginning, I made the round on my bike. To make it easier I bought the moped and discovered that I now was so fast that I could manage a similar job for another association. More money for the very poor student. Now. Wasn't that clever? I thought so. Is there anyone who would like to know about the introduction and short life of national liberalism in Denmark? Probably not - and perhaps not surprising. Actually, I just want to tell you that today I have assisted eldest granddaughter a little with a history thessis that her otherwise friendly school had asked her to do. And the thesis was on the above mentioned topic. So now I know everything you should know about Danish politicians, national liberals, from that time. And it's not little. I feel able to give a talk in any historical association or possibly a lecture at one of our learned universities on this particular subject. A few anecdotes may also be told among the many erudite words. Otherwise everybody would fall asleep. And my fee will be more than reasonable. I shall soon be on my first retrieve this year. For that reason I took out my well-worn bugle in order to practice. I have not touched it since my latest shoot on Boxing Day 2011. To my pleasant surprise it sounded quite well, actually rather nice, although Matron grumbled a bit when she observed I had found my bugle and she hurried to close the door to the kitchen. I think she does not appreciate bugle music as much as I do. But amidst the beautiful musik I spread around me it did not avoid my attention that there was not much air in my lungs to operate with. Only three not very long signals I could manage, followed by many deep and panting breaths before I again was able to breathe normally. I was up early this morning - around 10 o'clock The reason for this early rise lies in the fact that there was an agreement between Matron and myself that all garden furniture should be moved indoors, and a thorough cleanup of my self-built tool shed should be done in order to make room for the just mentioned furniture. This definitively indicates to me that the summer of 2012 is over and autumn has begun, so now it's soon Christmas, and after a short and mild winter we can hopefully look forward to spring and once again we are going to haul out the same furniture. Isn't it just wonderful that it will soon be spring? Denmark is world famous for taxes. Especially one of them I find interesting, "The Swelling Tax". Yes, that's its name, believe it or not. It must be one of the most imaginative taxes in the world, and it is paid by buyers of soft ice cream. "Swelling" is what happens when the fluid mass is cooled and air is added to make it into soft ice cream. We already have a tax on ordinary ice cream as such. However, soft ice cream is difficult to put taxes on since it - before being whipped up - is merely a liquid mass consisting of milk, natural fat, and flavors. But this does not stop lawmakers who have a unique imagination when it comes to getting money out of innocent people. Denmark must be the only place in the world with a taxes on air. 50 % of soft ice cream is air that is 'injected' into the milk and fat to give it fullness, to swell. So we have taxes on air. It had to come sooner or later - and then it happens to be on soft ice cream, my favorite ice cream. At the end of our road lives a busy man. Just now he is restoring a large sailboat. I would estimate it to be 23-25 feet long. I very often see him working hard at it. The boat is to be repaired both inside and outside - a huge task that has already lasted 18 months. The proud owner estimates it will last another 18 months till the beautiful ship can be launched. I am a great admirer of people who take on huge tasks. I've never been good at it. 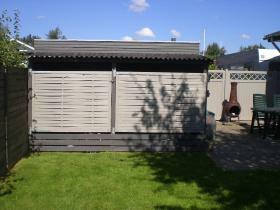 The closest I come is my tool shed that I (almost) put up myself 7 years ago. It was a kit from Bauhauss. It took 1½ weeks. I also (almost) bulit my workshop myself - also 7 years ago. It took a week. But I could never manage a 3-year assignment. I possess neither the patience nor the craftsmanship skills for big tasks. A 3-year task would for me last 6 years. I would pause half the time. It's the strangest subjects you now and then happen to think of. 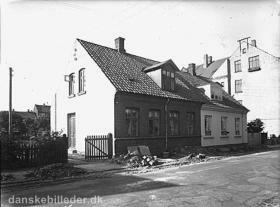 I was born on 4th floor of School Street in Silkeborg. Then my family moved to second floor on Frydensbjerggaard. Next stop was the ground floor at Møllegade. I left home when I was 18 and lived in the basement in my grandmother's house in Gesnersvej. So in terms of floors a gradually declining line. But then it went up. I could not get any deeper, could I?. 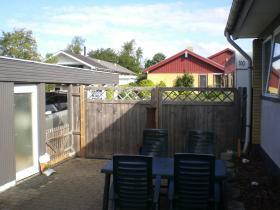 Next address was 2nd floor at Toldbodgade, still Silkeborg, and after that followed 3rd floor of Mejlgade in Aarhus. 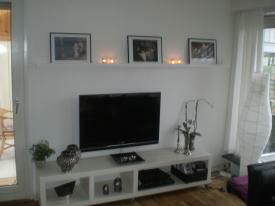 On my next residence I kept level, 3rd floor at Tirstrupvej in Risskov. Once again I "went down": Ground floor in temporary house in Risskov and finally ground floor in our current house in Studstrup. My "addresses", like so much else in life, have gone up and down. I expect to finish in the basement. I live with a threat, a threat that it's hard to forget. Today Danish newspapers write about the Danish tax system, VAT and others. BT, a big online newspaper writes, "Over a five-year period, the state raised the Danish VAT and other charges by forty percent to a soaring 298 billion kroners. And creativity in these times is great: From new taxes on tea, yogurt, ketchup and beetroot to tax on air that makes milk turn into soft ice". No newspaper should write about this subject. I do not think of possible falsehoods in the claim, but I think a lot of - and here is the threat - that articles of this nature gives Matron an uncontrollable urge to force me into the car and drive her south of the border to some mad shopping centers there. Here people shop as if all stores all over the world will shut down forever tomorrow. So I can only say, "Shut up, BT". My little grey cells are becoming a minority compared to some big, black and empty ditto. More and more often I find that I have forgotten something. It may be an order from Matron, a word I can not remember, or a name. You know, "What is it called, you know, one of these gadgets to see if something is completely horizontal or vertical"? Or, "What is his name? Yoy know, the chap with the big belly?" Today, however, it was something totally different I forgot. I was mowing. It went quick with my (almost) new lawn mower. But having finished I felt that it had been particularly quick. But so much the better, I thought. Therefore, it was not a big surprise to me when shortly after when I was on my way out to the garage I realized that half of the lawn in the front yard was not mowed. I simply had forgotten. The small, grey cells had failed me once again. Shame on he who thinks evil of it. Honi soit qui mal y pense. 4 months ago we bought 3 copies of a famous Danish painter's best paintings, the three pictures you see on the photo, albeit a bit unclear. For a long time I have been looking forward to getting them up, and with a little help from Matron, I managed to put up the shelf today and place the pictures on it. I received high praise for my good work - when I asked for it. PS: I thought it was an idea to show you both "Before" and "After". Glory, hallelujah, and other cries of joy. For the first time for 2½ months, I have been on my bike. And everything was perfect, even my legs were reasonably good in spite of a strong headwind on the way out. And the sun shone brightly upon my untrained body while I silently singing pedalled my way through the landscape. It was not a long excursion, only 16 kilometers (10 miles). But just sitting on my bike again after so long was just fantastic. I enjoyed every pedal stroke I took. What makes an old man happier than having his hedges trimmes without lifting a finger? 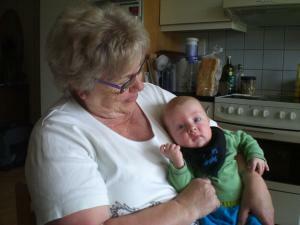 This morning eldest son arrived, fortunately with his better half Anette and son Frederik. He brought a monster of a meter long, motorized hedge trimmer, and within about half an hour the matter was done. It would have taken me 3 hours. Besides the advantage of getting the troublesome job done I could rejoice over Frederik's always happy smiles, shouts of joy, and babblings. Not a bad deal. And the friendly "hedge-cutter" even promised to come back and cut my hedges in June next year. After having disinherited him countless times I might consider putting him back in my will. My molded sofa has taken up my time all day. It let it me free for about 3 quarters of an hour, though, while I went for a walk with our two dogs. I haven't been out walking very much recently, and this together with guests from England and good meals made ​​the digits on my scales grow bigger, too. Something will be done about that very soon. I shall eat fewer meals per day, and I shall see to that my walks are in a fixed plan. 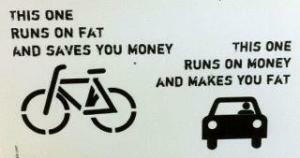 And soon my bicycle must have its comeback. It will be a busy time, I am sure. I wonder if I shall have time to eat? One might get very hungry by all the activity. Even Bilka, one of our biggest stores, has its advantages, especially if you are a "hot-dog enthusiast" like I am. While our British friends and their eternal companion, Matron, moved around between the shelves in the store, I sat in the cafeteria reading my newspaper and enjoying a superior vintage of Pepsi Max. A peaceful calm fell over me during the three quarters of an hour they were gone. The newspaper was thoroughly read, and there was also time to ponder - and enjoy my Pepsi Cola. Things turned into something almost even better, because when the three of them returned I was offered a big hot dog, one of those that only an expert can eat without having to get mustard, tomato ketchup, remoulade, roasted and raw onion, and cucumber salad over both your hands. 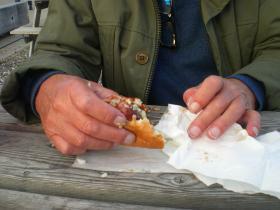 Eating a big hot dog without wasting anything is an art that is only mastered by few. I am one of them. A new bus service is under heavy consideration. It is probably needed - and will be long. I'm not talking about 'Arriva' or 'Midttrafik' in and around our town, Aarhus but about a 8,000 km. long route between Birmingham, England and Mirpur in Kashmir in Pakistan. That certainly is going to be quite a bus route, and you do not change bus on the way. It will take about 8 days for a single trip, and nights are apparently spent in the bus. One can only hope that the bus toilets can take the pressure. The route will run through Turkey and Iran and then through some of the most uneasy areas in Pakistan, with lots of Taliban. So probably it is not worthwhile booking a return ticket (300 pounds), but buying single tickets (2 x 150 pounds) when you need them. However Mr. Khakor, minister of transport in Kashmir, ensures that all roads will be safe. I can only wish for a good trip for those who wish to purchase a ticket (single or return), and I do not see the route as a competitor to bus routes in and around Aarhus. Today we visited my hometown Silkeborg with our English friends. It is always good to revisit this beautiful town and not least, that brother- and sister-in-law invited us all together on a cozy and very good lunch. Good food in good company is not to be despised. Only there was all in all one minus about the whole experience, the weather. It was miserable, grey, soaking wet, and boring. The good lunch, the beautiful town, our kind hosts, and we 4 visitors deserve much better weather than this. I think the municipality should intervene and do something about it. Together with our English friends we visited IKEA today. It is far from my favourite pasttime so I was allowed to wait in the cafeteria. I brought today's newspaper and went to buy a cup of cocoa that turned out to be a mixture of coffee and chocolate - and I dislike coffee very much. I told the lady at the cash that I did not want to pay for that brew. She told me to make another cup. I did. And it tasted exactly like the first one. Same happened at the 3rd cup. Only then I found out that "CHOCOLATE" in Danish is in fact a mixture of chocolate and coffee, and I found a button with the good Danish word "CHOKOLADE" and got what I wanted. I didn't mention my mistake to the cashier. I saw no reason for it. In childlike playfulness I wanted to get up into the position, and for this to succeed I had to pass through a narrow staircase from below. Then I had to climb a high concrete block at the bottom, so that I could look out and have my picture taken. To come down from the high concrete block I poor man had to bend very much down in my right knee and "jump". Unfortunately there was only very narrow space for this athletic exercise. And it did no good to my knee. It was bent a little more than I liked, and even today the pain can be felt a little when I have to walk - and I often have to. And what can one learn from this debacle? Let me tell you, "Do not think you're 25 years old, when you are almost 72". 1) It must sell flowers and plants. 2) There must be a bench where tired old men can rest their worn out bodies while the more interested people have a look around and perhaps buy something. Together with our English friends we visited a garden center today. It lived well up to point 1 while it could not manage point 2, albeit that some time ago they did had such a bench. I got quite angry and contacted one of the green-clad assistants and asked for a reason why they had chosen to abandon the "resting department". Regretfully she told me that she did not know why, but she agreed that I looked like someone who might need a bench. The investment begins to pay off. Eventually. 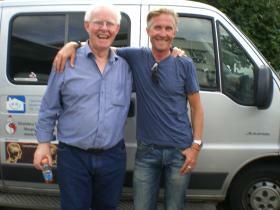 Within 2 months, son and son-in-law saved me quite a bit of money on repairs to our caravan. It is pay back time. A few months ago son-in-law repaired a drawer that was about to fall out. I saved about. 1000 DKK. Today oldest son repaired the gas heater. Saved me about 1000 DKK. Really you should add a few hours of inconvenience to me plus diesel to deliver and collect the caravan at the caravan store. 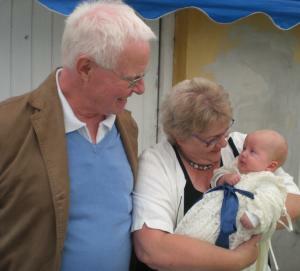 It is good to have children and in-laws - and of course also grandchildren. The importance of today's repair is underlined by the fact that we are being visitted by our English friends that we have known for 54 years. And consequently we sleep in the caravan, and frost is expected from tonight. Luckily enough one is not fruit farmer. Already now I can predict that next year's fruit harvest will be very poor. "How do you know that?" I hear you ask. From old almanacs you can learn that if the 21st of September (today) is bright and sunny next year's fruit harvest will be good. If not prospects are mjserable. And as you may know today is almost unbearable, real foul weather. It has been raining since sometime last night, and the rain continues. Perhaps this is why, according to the same almanac, today is the very day that all worms will be digging deeper down into the soil. Who can blame them - with the weather we are having. Matron is keen on a new awning for our caravan. She claims (and probably rightly so) that it will be a lot easier to put up than either of the two we have. For that reason we spent part of the morning among a caravan dealer's tempting offers. I shall be much mistaken if we do not get the new awning, even if it requires us selling the two present ones first. 4) Hung out on my exercise bike for a quarter of an hour, and I really biked (super hard). All in all, a hard but wonderful day. Life is so beautiful. Believe it or not. I am sitting here in our own living room watching live cricket from Colombo, Sri Lanka, world championships in 20-20 (Eurosport 2). It's not every day you can watch cricket on TV in this country, especially not live - and even with a Danish commentator, Ole Mortensen, who used to play for Derbyshire. It's good entertainment, and I am enjoying every bit of it. To my pleasant and big surprise my team, AGF, won once again last night. The win was celebrated by the whole family, also by Frederik. The AGF-dummy had to come out which the young man fully appreciated. I have a sore knee and have had so for a week. Very sore. Nevertheless Matron keeps nagging at me that I ought to stand up and do something. But what can a man in my situation do? Half invalid. She is hysterically busy cleaning the whole house from top to bottom because we are going to be visited by our English friends next week. When she has finished her job everything will be shining clean, even the top of the toilet cistern. I think all that cleaning is why she keeps coming after me telling me to "do something". But I refuse it (as long as I dare). We are expecting our English friends to visit us from next Saturday. 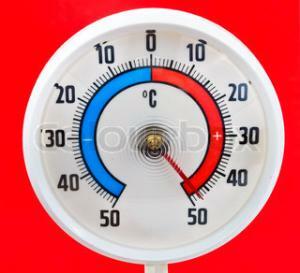 Unfortunately the weather forecast indicates that temperatures will fall from tomorrow. We have a tradition that the weather is always bright when our friends are here. So, why shouldn't it be perfect when they will arrive on Saturday? And furtherrmore my experience with meteorologists is that the weather will be right opposite to what they say. I am rather keen on hot dogs if only they are made the proper way with mustard, ketchup, "remoulade", raw onions, and cucumber salad. And the sausage mut be of a high quality. But also the size is important. 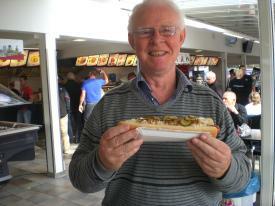 Today I happened to find the biggest hot dog I think I have ever seen, just about 15 inches long. It was impressive - and very good. The only unlucky thing was that I could hardly eat it. Today the sun rose at 06:42 and will go down at 19:32. Just now I am looking out the window and as far as I can see the sun has already gone down, albeit at only 18.30 or thereabout. The day has declined by 4 hours 42 minutes.The length of the day is now 12 hours and 50 minutes. It is disheartening to feel the autumn coming, but we all have to get through it and look forward to next spring. I do. In turn, I am very happy that the moon rises at. 00:08 and goes down at. 17:45. Why that pleases me I do not really know. But I like to be happy about something. This morning I met 2 childminders in the street. They each had a pram with 4 children in it. The children were between 1 and 3 years old. Coincidentally, we met outside a bakery shop that I had just honored with my visit and purchased a number of rolls and Danish pastries. I could not help but to talking to the cute kids which clearly delighted both them and their "foster mothers". 4 children gave no congestion in each of the big prams, and I noticed that each child had seatbelt like in a car. When asked one of daycare minders told that it was a requirement, because you never know what little children could do. I looked a little further at the big prams and suddenly noticed that they were electric. What do you think of that? A pram driven by electricity! A small push at a button made it move. I found it very impressive, but I was told that the introduction of these prams had spared many a childminder for shoulder- and back injuries. I found this sensible, and it made me think of my self-propelled lawn mower. Perhaps my shoulder- and back pain could improve a bit after my purchasing one. It's become a bit late. I should have finished my diary much earlier. But the point is that I generously invited Matron for dinner at 6 pm. at a nice restaurant. The food and drink were great, so time went very quickly and not until now (about 10 pm.) have I had the time. But I hope that my giving a noble invitation to my sweet wife will make you forgive me my delay. I shall try to improve tomorrow, but who knows what will happen by then? Today 117 years ago a certain William Shilloch made himself a "famous" burglar by steeling the silver "FA Cup Trophy". It was in 1895. 68 years passed until he confessed his sin. He explained that he had melted the trophy and made forged ½ crown coins out of it. I suppose the trophy is better protected today. It's still made of silver. Sorry. I admit my error. I have neglected my diary since Friday. The reason is that Matron and I have been deeply engaged in a wooden ship regatta in Løgstør, this glorious place by the Limfjord. The trip gave many experiences both as far as ships and food are concerned. The latter gave me the opportunity of seeing my old army mate and good friend, 82 Kruse, at war with a "hot dog" purchased from the famous "Tulle" who owns the best and only hot dog stand in town. It is with regret I must announce that the "hot dog" won the battle. The result was ketchup, pickles, onions and mustard on all 10 fingers and on most of his torso. It was shameful to watch a former tough warrior from the fire-breathing Jutland Telegraph Regiment having to give in to the enemy. This morning I made a major decision. I informed Matron in no uncertain terms that yesterday was the very last day on which she was in charge of me, and thereby removing whatever rest of autonomy I might have left. I shall from now on be an independent and liberty-seeking person who makes his own decisions and plans his day himself. Of course I had to gather quite some courage before I said it. But I did. Matron hesitated a fraction of a second and exclaimed, "Do you want to bet on it"? Since I am not a betting man and never have been I was forced to withdraw my statement, and everything is back to normal. So today I have been very busy doing what I was asked to, cutting a myriad of roses, loading the car for the dump, going over there, and unloading the car. Hard work. There is, though, a degree of security in somebody telling you what to do. When I woke up this morning and was contemplating a bit, I realized that at my age one is "former". I look at it completely without bitterness - that's life, it's just a fact. I am a former sausage stand man and bakery worker. I am a former college student, teacher, vice head teacher, and administrative leader. I am a former cricketer, handball player, tennis player, badminton player and icehockey player. I am a former cricket umpire and handball referee. 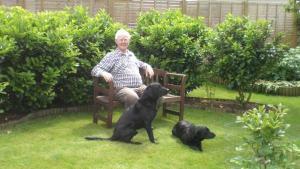 I am a former retriever judge, retriever instructor, and chairman of the local retriever club. I am currently a husband, a father, a father-in-law, and a grandfather to 4 children. I am currently a happy and satisfied man and very pleased with life. I love it. PS: Today at 1.42 p.m. it was exactly 7 years since It put out my final cigarette. When I woke up this morning I had no idea that before sun down I would be the (un)happy owner of a new lawn mower. But I was. I cannot feel quite happy about the purchase because it was so unreasonably expensive, but on the other hand it has an electric self-starter and is "self-proppelled". That pleases me. The reason for this much too expensive purchase is that the old broke down completely. It died with with a mighty gasp. It had the same fault as the previous two mowers. When you do not periodically pour oil in things will go terribly wrong, and everything inside will melt down. But I think it is notable that two lawn mowers in succession have the same fault. I have a great inclination to complain to the dealer and ask to have my money back. 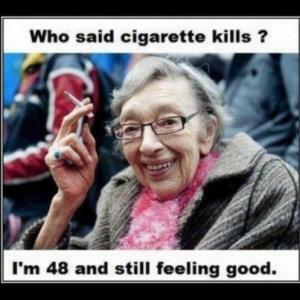 Matron has got a good idea. I often envy her her wealth of ideas. She has always been thorough in checking the receipt we receive every time we buy something in a supermarket. And often there are errors which mean that we have paid too much and should ask for money back. The sweet lady's idea is that this money is placed in a special savings box. Within the last week we have in this way saved 57 kroners (about 7 pounds). Today alone was 35 kroners in one supermarket and 7 kroners in another one. If this amount would be the same for all weeks in the future, next year's summer holidays will be ecconomically strongly supported. Just carry on with your errors. They are our savings. And Matron will surely find them. Saturday at a birthday lunch and afternoon tea with second oldest grandchild and his mother. Wonderful food, of which I had too much and was punished at the next event, cousin-reunion. I had to refrain from eating as much as usual. But I listened and talked just as I always do. Went to bed around midnight. Today up early and breakfast with son, daughter in law and two grandchildren followed by a very long visit to a socalled Horse Market. I did not see one horse, but a flea market that I consider the biggest I have ever visited. It took a long time to see it all. Now my strength has gone, and once again I am sitting with my feet up watching Vuelta a Espana. Wauuggh. Isn't life just great? We just had the ground floor, approx. 50 sqm., And we were in all five. Not much room. On the first floor lived Mrs. Christiansen who had once owned the house, and when she sold it to the municipality, she rented it. In her apartment lived before her a certain Asger Jorn who became a world famous sculpturer and painter. How long he lived there I do not know, but at least long enough for him to get into arrears with his rent. The old lady did not like that, and she frequently asked for her money. Eventually Mr. Jorn offered her 4 tea mugs (clay) which he had made himself. He had painted them with his famous imaginary animals and more. The old lady did not accept them because, as she told us, "They did not even have a handle". She asked him to sell them to somebody else and pay her. He apparently did. She could have made quite a fortune had she kept the 4 mugs. Today I have attended a farewell reception for a former colleague at my former workplace, Jellebakkeskolen. It gave me the opportunity - in addition of course to greet the day's most important person who has been employed at the school for 39 years - to meet former colleagues, employees and retirees. It is always interesting especially to meet the old ones, and it brings nostalgy out. It raises wonderful memories, fortunately mostly amusing ones. "Do you remember the time when ......."? As a rule the person you are talking to does not remember, and you have to tell the incident once again, and it has not been less exciting since you told exactly the same story a year or two ago. But how nice it was to be there. Isn't life wonderful? Here I sit quietly and relaxed and will during the next two hours do nothing but follow today's stage in "Vuelta a Espana" on TV. I have of course both legs up, computer positioned on my lap and sitting comfortably in my molded sofa. Some olives and a cold Pepsi Max are within reach. Yes, thank you. I feel excellent. But such a pleasure must be earned, which I have done by painting two walls in our utility room. I was glad to be allowed doing this since I feared withdrawal symptoms (see yesterday's description). But once again, I was refused to paint the floor. Matron insisted on doing it herself. My protests did not impress the sweet lady. Maybe she didn't hear them. If one day it appears that I for unknown reasons should not have to paint, I must expect a heavy attack of withdrawal symptons. The painting here at our address has been going on every day for several weeks. I have got more than used to it. Fortunately, today did not bring me any withdrawal symptoms because I was allowed to paint some fence posts, the porch including the door, and some walls in our utility room. Simply wonderful! Had I asked nicely for it, I might also have been allowed to paint the floor. But I did not have the heart to take the pleasure away from Matron. I wonder what I am going to paint tomorrow. Hopefully Matron will find something for me. I do not like withdrawal symptoms. There is no end to Matron's and my keenness to paint fences. Just as we both think we are through we get new ideas. Just look at the two pictures, the first one is from August 17th, the second from August 27th. Can you spot the difference? If so, send the answer to me. Please use my "Mailbox" (click here). There is a prize to the lucky winner, chosen by a draw among the entries with correct answers. The draw will be executed ​​by public authorities (i.e. me), and the prize is a walk round a very beautiful lake not far from here. The walk is much recommended. It is very beautiful, takes an hour or so, and there is no risk of you getting lost. Just follow the path. I admit it. I'm "mad" about bike races and -riders. I follow them as much as I can. 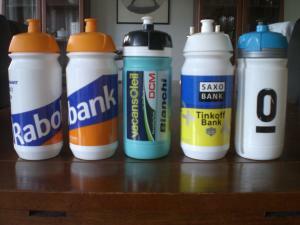 And it's not because I'm indecisive that I have water bottles from 4 different cycling teams, "Rabobank" (2 pcs. 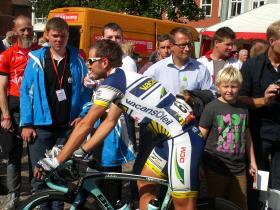 ), "Vacansoleil", "Saxo Bank /Tinkoff Bank", and the now closed team "Leopard Trek". 3 bottles I got as a result of my relentless bottle hunt among team buses in Silkeborg last Friday. Had I had more time I would have visited more buses - and got even more bottles. But I also had to take photographs. Let there be no doubt. 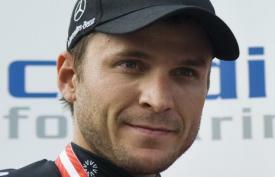 "Vacansoleil" is my team for the one reason that my hero, Martin Mortensen, rides for that team. However he deserves a team that will appreciate him more. And should he change team - which I hope he will - I shall do it, too. But now the best: Our visit to Silkeborg which involved "close contact" with all the big names - also at the hotel where we had brunch - made Matron almost more "bike-mad" than I. In fact she recognized more of the big names than I did. I love being married to her. There's a lot I do not understand. 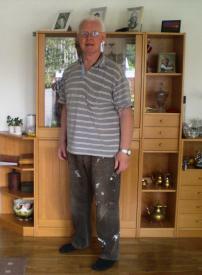 When I got up this morning Matron told me to paint our utility room, so I immediately had to put on my working trousers. I did (see picture). Again arriving at the kitchen the message was that before the painting job I had to transport the sweet lady to a supermarket. At the same time she issued the order that I surely could not go in my working outfit. Changing trousers is for me a most annoying activity and I tried to convice Matron that no one at the supermarket would come up to me and say anything negative about my spotted dress, let alone point their finger at me. We could not agree on this so I put on the latest pair purchased only a short time ago and we could set off. I do not understand what difference it made that I arrived dressed in the finest pair of trousers I have. There was not even one who complimented me on them. 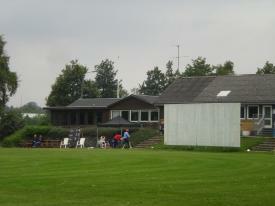 namely watching at a cricket match in Skanderborg together with grandchildren, children and in-laws. Now there's the eternal problem that a cricket match should be watched in sunshine and pleasant temperatures. Neither was present, so the younger part of the family wisely chose to spend their Saturday at home. I fully understand them. However, Matron and I had decided that we WOULD watch cricket, no matter what and even if it was a bit cold and windy. So we took the chance. 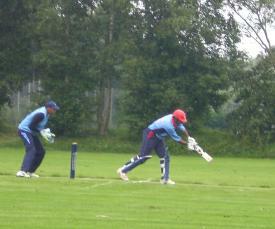 We watched exactly 1 hour's cricket till the rain came - and went home and had lunch. It was the 2nd attempt this year to watch a cricket match all together. 3rd time lucky, but it probably will not be until 2013. Another good day with great experiences. This time from the cycling world. It all started with Matron inviting me to brunch at a nice restaurant by the river in Silkeborg. 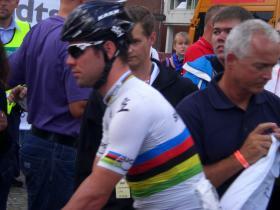 After that we went to the town square to see the start to the king stage of the bike race "Tour of Denmark". We had brunch in the same room as world champion Mark Cavendish other cycling celebrities. It was great. I photographed some of them there + more from the presentation. See pictures at "Mit Fotoarliv" (click here). I saw many of my idols. I was so close that I could touch them had I wanted to. First Martin Mortensen (my idol and "nearly" friend), second Mark Cavendish (English world champion and winner of several stages in The Tour of France), 3rd Lars Bak a (Well known Danish rider), and 4th Brian Holm (former Danish rider, now sports director of one of the big teams) together with the old man himself (known as a cycling enthusiast with a past as a solid rider and cricketer). It has been an eventful day, a dream day - and in a few moments I am going to watch another bike race on TV, "Vuelta a Espana". Definitely one of the best days for a long time. 1) Doing the beds, 2) vacuum cleaning the whole house, 3) sanding and painting tabletop first time, 4) painting fence posts second time, 5) making lunch, 6) final painting of fence, 7) sanding and painting tabletop second time, 8) mowing our lawn, 9) tidying a bit in my workshop. It's more than I should be able to endure. But be assured that I have enjoyed being able to do it. And as soon as the rain stops, I 10) will go out for a walk. 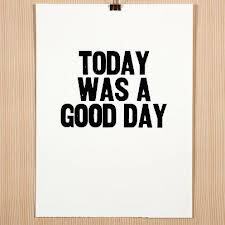 It has been - and will continue to be a good day. I have very often complained of the quality of meteorologists. And I still believe that they guess and that my guess is as good as theirs. 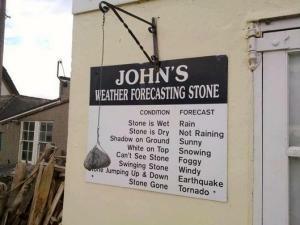 So I was pleased when I saw this weather station. I trust in it. It cannot fail and is a lot cheaper to run. After the many hours I spent on painting fences and garden gates, I thought it would be only fair that I invited my sweet wife on a lunch. Fortunately she said yes, and we set off to a fish restaurant at Grenaa. 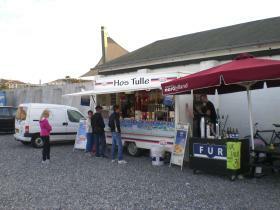 We know the place quite well, and that they make ​​good food at affordable prices. And once again we were not disappointed. As we sat waiting for our food we happened to meet and talk to 5 men from Fuenen on a cycling holiday. They were all well inside retirement age and had started their rather long ride catching the train to Horsens and from there in daily stages of about 50-60 kilometers reached Grenaa. From here they were to go on. They told us that they slept in 5 small one-man tents. 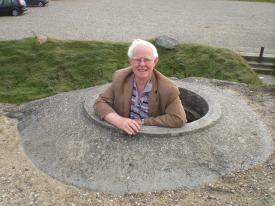 This - they said - was more discreet if they were to have "a visit" in the night. The chat with the 5 bike riders made ​​me want to have a similar holiday, only I will be very particular NOT having to sleep in a tent. I am sure my doctor will agree with me. It will not be good for me, he would say. 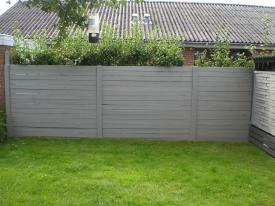 Yesterday Matron on behalf of both of us agreed that the big, freshly painted fence should have another coat of paint. This agreement hit me hard. I had not seen it coming. However I do not decide very much and have - as a result of the "Agreement" - today swung the brush in rapid but unhappy strokes on top of the only 2 days old paint while I inside myself sang all the protest songs I could remember. They were all songs that rebelled against oppression. I always have a hard time when painting. Once again through the next three weeks I shall be sitting glued to my molded sofa to follow the world's second largest and undoubtedly toughest race, "Vuelta a Espana". 21 stages, many of them mountain stages, in 23 days. Unfortunately, I missed a lot of the "Tour de France" in July. That was sad. Sitting so many hours in front of your TV every day is an art form that I developed over many years of experience with big bike races. It takes time to learn it, but supported by your domestic staff (in my case Matron) with appropriate snacks and drinks in between will help you gettiing over the initial beginner problems. I mowed our lawn today. I waited till the temperature was at its peak between 2 and 3 in the afternoon, approximately 29 degrees. Then I started. I hate to be cold when I'm mowing. To make my effort a little more interesting I put on my white summer cap and Matron's pedometer. It enabled me to learn that mowing our lawn "costs" 3,050 steps. Well, that is ieally interesting knowledge. And then I did not even mow the front lawn which would have added another 5-600 steps. My summer cap was there only because it is summer. In winter I put on another one. Today is both a kind of a sad day and a kind of a proud day. 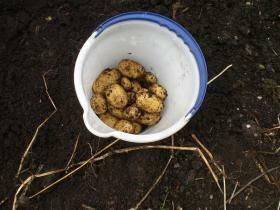 The last potatoes are dug up. That was the end of that season. Three plants were left when I started digging, and they were kind enough to provide us with 2 kilos really good and big potatoes. All in all it has been a good year for potatoes with a harvest that - like all Olympic Games - is "the best ever". However. Now I need to go through the usual hard and nervewrecking negotiations with the EU to get my subsidies out of the huge bureaucracy (i.e. an organizational form, which is characterized by hierarchy and rule management, and originally comes from the military). Unfortunately, I have to admit that through all the previous years I have not succeeded in getting a penny. But this time I am sure to get what is rightfully mine. I'm simply going to tell the EU that if the organization does not send me my eligible subsidies Matron in person will turn up at headquarters in Brussels, and then they surely will regret that my money has not already been sent. Have a look at the weather forecast for the next few days. It will be hot, very hot, just right for those of us who are keen sunbathers. Consequently my plan for Sunday will be to go to our local, public beach wearing my very diminutive trunks. They are my answer to the G-string. I will spread my blanket on the sand, lie down on my back and let the sun brown my muscular body. I know from experience that even though the beach on my arrival is tightly packed I shall in no time have plenty of space around me. At certain occasions I have managed to empty the beach for other bathers in less than fifteen minutes. 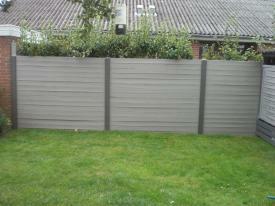 As mentioned yesterday I left a fence just primed and with an expected rapid completion with the final layer of paint. Since Matron thought that we might have rain tomorrow it had to be today. Consequently I was up extremely early and out with the brushes before the sun was directly on the fence. Fair to mention my sweet wife helped with a small brush and spent quite some time searching for unpainted spots that I by accident had left behind. But she is a good motivator. 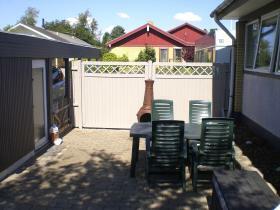 She thought we might just as well continue and also paint the two doors to the garden tools and the waste shed (right picture). And now it is all there, freshly painted and nice. There are only two fences left to paint one of which is so large that I thoroughly consider a walkout. PS: The bag containing potting soil (left picture) remains where it should be (see yesterday's diary). There are two things in life I can not stand: Vomiting and painting. The day before yesterday Matron gave the order that all our fences should be painted. As seen in the two pictures "before" and "after" it is exactly what I've done - at least with one of them. Now, do not think that I'm a sloppy painter although it looks like it on the right picture. It is only a primer and soon the next layer of painting will be added and it will look as it should do. I cannot wait till it is finished. The observant reader will note that the plastic bag of potting soil in both images is standing at the door. This has been the case since October last year. I hate changes. It would be cheating, almost a crime if I didn't tell you about the the evening meal that my sweet wife cooked for me last night. I do not hesitate in nominating it the tastiest meal I've had in my till now nearly 72 years - nothing less. The basis was a marinated pork tenderloin. And it was very good. But the accessories, uhm, uhm, uhm. Absolutely fantastic. Some large fungus, hollowed and fried with garlic butter and oil. In addition, a special and spicy cheese that was was in the oven for 5-6 minutes, lettuce with a dressing of blended feta cheese in sour cream and garlic, and finally fried potatoes. It was heavenly, I tell you. The good lady has outdone herself once again and has promised that it might not be long till we are going to have it again. Then I must learn to prepare it myself. It was abolutely top class, beats anything I've had before. 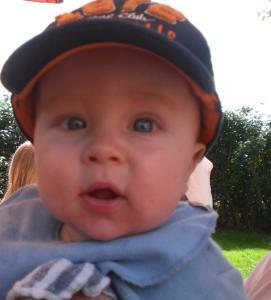 I think it would be cheating if I didn't bring this picture of youngest grandson Frederik, now nearly 5 months old. I took the photo yesterday at a family lunch with Anette's and Peter's family. I attended a church service today which is unusual on a Saturday. 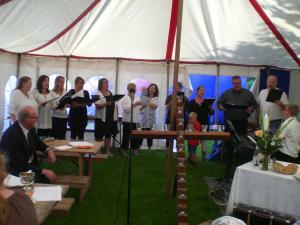 Even more unususal was that the service took place in big awning on a sportsfield. The service was primarily for children so I had no problem understanding the text, Daniel in the lions' den. The real reason why I was there was that the church quire in which Anette and Peter sing was there, too. They are very good, at least semi professionals. Have a good look at the photo of the quire and notice that also youngest grandchild Frederik was there on his mother's arm. I think I have had Olympics enough. It has grown a bit too much. In fact one can watch sports from London from when one gets out of bed until one turns in again. And it is hard to think of any sport that is not included. It easily becomes somewhat boring. But from today it is going to be a lot better. Finally we reached the point where synchronized swimming is represented on TV. Now that's very exciting. You can get quite euphoric by watching the nose-clip-wearing, tightly combed young ladies who constantly break the surface with either head or feet first. To be honest. To me it's the most boring sport to watch at all. But in Denmark we are lucky enough to have two very funny TV-commentators on synchronized swimming. They more than compensate for the boredom with their witty and sarcastic comments. They make a joke of it. That's the only reason why I watched most of it today. a) It has been two years since the last control. So it had to be done. b) If I accept the car to load less I can save DKK 5,000 per year in taxes. And this requires a car inspection. Two birds with one stone. 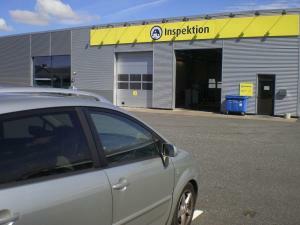 Therefore Matron and I this morning went to the nearest Automobile Inspection. And we passed with flying colours. A spotless approval. It's like passing an exam. However I had expected this since Matron, before the inspection, had a talk with the manager. So it had to go as it did. Afterwards she was still so happy with the good result that she right away allowed me to buy her a new electric kettle. For that reason alone I shall never forget this day. Over the last few days significant negotiations between Matron and I have been ongoing. For quite some time I have felt that my right to make my own decissions has been smaller and smaller, perhaps even non-existent. So I thought I could obtain something through negotiation. It's gone reasonably well. The sweet lady accepted that from now on I may decide myself whether I start my morning shave on the right or on the left cheek. Likewise, I may also decide myself where I start my tooth brushing, up or down. The success may have made me overconfident, so I tried to obtain a greater say in what clothes I should wear. I did not get far. The furthest my good lady could stretch was that from now I am allowed to decide what socks I want to wear - as long a they are dark. I might consider asking for yet another round of negotiations, but Matron has turned my suggestion down, making it difficult for me to reach anymore. But after all I did reach something. You may quite well be pleased when I tell you that a survey in Denmark (read it today) shows that we Danes think that the English are the most amusing and entertaining people in Europe. They have a very good sense of humour, understated, sarcastic and similar to our own. Overall the English are very popular in Denmark. I am not surprised by the result neither that the French are considered quite annoying. Besides being that they also occupy the place as the least funny, least clever, and the European people we are least happy with. We do not think a lot about them. Danes are rather fond of Norwegians, too, not surprisingly. In many ways they think and act like we do. The survey is made by "YouGov" on behalf of a nationwide Danish newspaper. Well done, England. I am pleased about the result. Hope it is mutual. Matron is very keen on us eating healthily and having long walks. I am even keener on either, so it is not difficult for us to agree on menu and exercise. Traditionally it is the menu that interests me mostly, and it is with immense joy I have learned that the sweet lady has found a recipe for a very healthy wok. We've already had it a few times. It tastes heavenly and is healthy beyond everything. Just look at the picture, what the main ingredients consist of, cabbage, carrots and cauliflower, and added some small pieces of grilled chicken and various spices. It's just super. 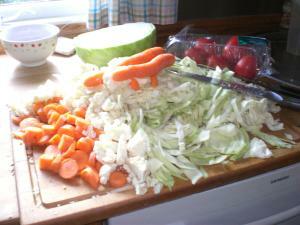 It makes me look forward to supper tonight - and mind you, I chopped the vegetables. Today's exercise was a walk in rather high speed - approx. 40 minutes. Isn't life just wonderful? If someone would ask me how I prefer to spend my Sunday I would reply, "Just like today." Next question might be, "And how was today?" To that I would explain that the entire closest family were here for lunch, children, in-laws, and grandchildren. There is very little I like more than having all these wonderful people around me. The fact that they sometimes laugh at me, for example with my hearing and my memory, I consider part of the entertainment that should always be an integrated part of a nice lunch. I don't mind contributing - even if it is involuntary. And they must come again soon. If they do not, they may have to live with the threat that I shall visit them. That will teach them, I am sure. At a visit this morning at a local supermarket Matron and I after having finished all the shopping stood at the cash to pay. The 18-year-old young man who served us suddenly opened his mouth in a huge yawn. We were spared of nothing, neither openness nor sound. Nor did he put his hand over his mouth. All teeth were visible. "Well," my good wife exclaimed, "you surely went to bed much too late last night." The young man willingly admitted and said that this - as we all ought to know - quite often happened to young people. He looked suspiciously at me when I said it certainly did not happen to me in my youth. I always went to bed in due time and was never yawning the next day. Still looking suspiciously at me he also told that last night he had worked till 10 p.m. and then "gone to see some friends." Nothing wild, he claimed, but he was still not in bed till about 2 o'clock. He met at the supermarket at 8 a.m. this morning, so he had had no more than 3-4 hours of sleep. How I remember similar cases from my own young days. In my younger days in Silkeborg, I knew a postman, who was very fast. In fact he was Jutland champion in 100-meter sprint. He was a cheerful and happy man with a singing voice beyond the usual and he always had a funny comment on what happened. His workplace of course was the post office in Silkeborg. Also here he had funny and unusual comments. For example he always, when a new colleague had arrived and had been there for a week or so came up to him and said, "I do not care at all what the others say about you. I think you're alright." This may have given the newcomer a bit to think about. A picture from the days when teaching was a "male job". Out of 22 teachers, 15 were men. Note also that out of 15 men 14 are wearing a tie. Much has changed since. Now 15 out of 22 teachers would be women, and neither they nor the men would wear a tie. 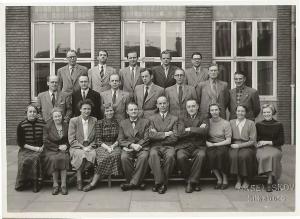 This was the group of teachers who welcomed me in secondary school in 1953 at "Silkeborg Municipal Secondary School". And I recognize all of them except two. Seeing them all brings back both horror and delight. Some of them were absolutely scaring. Fortunately others were more kind, and among those is my favorite teacher, Nielsen, standing to the left of the picture in the back row. A wonderful teacher. Number 3 from the left in the same row is Bach Rasmussen who was the direct reason why I became a teacher. He was a fabulous storyteller, and I thought that if I could be just like him my fortune would be made. He, too, was a very good teacher, albeit on the "tough" side. I have had to note that my approach to gardening has taken a U-turn. When previously I saw it as a "war", something that had to be overcome in a hurry, I now have a very different atttude. Sometimes I catch myself enjoying it - even when today I trimmed some of our hedge. It was exhausting because it is so high. And it was not because it needed trimming, I just thought it would look nicer. There you see. I have even started planning my garden work several days before and be looking forward to it. This was not the case just a short time ago. 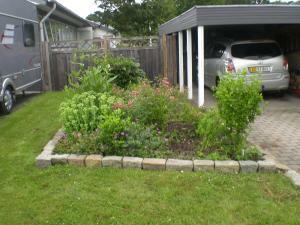 Right now I am looking forward to having to work on the small bed around our flagpole. So I was a bit amazed when today I read that 51% of all garden owners believe that gardening puts your marriage to the test. I'm happy to tell that I belong to the 49%. I love parties - perhaps excluding huge celebrations with several hundred people gathered in a (perhaps too small) room. Friend- and family gatherings are my favourites. And the main character was thoroughly celebrated, and she deserves it all the way - alone for the reason that she is the mother of our youngest grandson, Frederik. She has plenty of other advantages, though. How wonderful it is to spend an afternoon in the company of good, old friends from our past in the retriever world. So we had invited some former "retriver-people". We have known them for more than 30 years. It was a nice opportunity to meet and share memories - and tell the new "tales" with the traditional exaggerations. We are all quite good at that. The fact that we also had a delicious lunch only made the day even more perfect. Matron had laid the table already last night while we were supposed to be watching men's handball at the Olympics (DK - Hungary). Suddenly I was asked to switch off the TV and record the match so that we could see it when the result was known. Matron is not keen on the excitement from close handball matches. So she got up and laid the table. But then it was done so that today I could concentrate entirely on cooking and not having to spend time on an apprenticeship job like table setting. It has been a wonderful day. What is life without good friends? I woke up at 8:30 and as usual I could note that Matron had already got up. I lay a little contemplating today's program. Then I got an idea. I grabbed my cell phone on the bedside table and called the sweet lady in the kitchen and asked if the good, old idea of ​​breakfast in bed did not exist anymore. She said that it had long since died and hinted that she at least had not experienced it for 15-20 years. She agreed, however, to come and give me a good morning-kiss. It's actually better than breakfast in bed. I can't stand crumbs on my sheet. Today our family, our children, in-laws and grandchildren, had a plan A and a plan B. 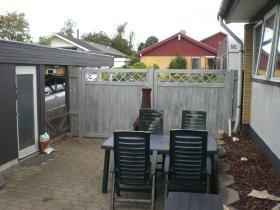 Plan A was to go Skanderborg (30 miles away) to watch cricket. We were to bring picnic baskets, beverages and folding chairs and - tables, spend a few hours sitting in the grass in the lovely sunshine, watching cricket eating and drinking. One can hardly think of a better way to spend a Saturday. However weather did not permit plan A. It simply poured down. Consequently it had to be plan B meaning that we all met at a family lunch here in our house. It was not at all a bad reserve plan. While the rain was pouring down we all sat around the table enjoying good food and drink and each other's company. Did we talk? 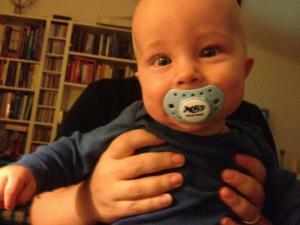 Well, our family, including the latest addition, 4-month-old Frederik, are rather talkative. But we're also good listeners. We do it while we talk. 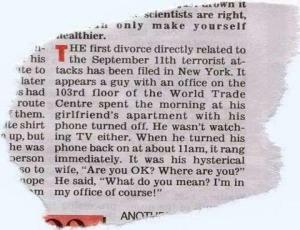 We can all multi-task, you know. Now the heat is here. And it is a blistering one. And I should not complain about the temperature. But it is difficult to cope with it after being used to 17-18 degrees. Suddenly you are face to face with 27-28 degrees. But as I said, I have no complaints. It seems that at long last skilled Italian meteorologists have been employed. They can provide hot weather. But right now they might just as well go home on a vacation and let the old, cool, Danish meteorologists take over for a short period. What about the hiring Italians for 10 days at the time? 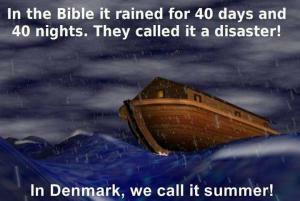 Then Danes for 4 days, etc. I find that is a good solution that would be acceptable to most. In spite of the heat I've had a fantastic day. Today a tough shopping raid in our southern neighbouring country. Two shopping centers (or rather the same one twice) and a huge supermarket were invaded by eldest granddaugter, youngest daughter, Matron, and I. Without hesitation items were ripped off the shelves and put into king-size shopping trolleys, transported to the cashline where VISA cards glowed. To me it was a tough day with much impatient walking back and forth while the three ladies' shopping interests unfolded in full bloom. But they are nice company. You may have noticed that my website has not been available since Sunday 22nd, all because of a wicked hacker attack at my webhost. But now I am back online. It has for me been two strange days when I could not perform my homepage obligations. But here we go once again. Today is a bit special since Matron and I participated in a joint bike ride, arranged by her for the two of us from here to a supermarket and home again. On the return trip one bike had to carry nearly all the goods. Unfortunately my bike cannot transport more than a box of matches in a tiny bag. By contrast my sweet wife has two large bike bags (which I have given her) and a bicycle basket. So unfortunately she had to carry nearly all our purchases. But she is tough and did not moan. 18 kilometers we went. Not bad. I hope for many repeats. 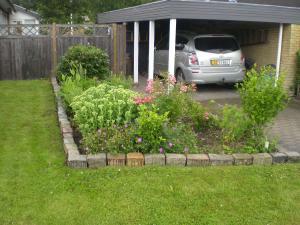 I had planned to weed a very small bed (see front of picture). It really needed it. After a thorough weeding, I called for Matron to inspect the result. 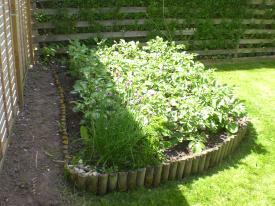 She walked right past it, and took a look at a somewhat larger bed (rear of photo) which was also overgrown with weeds. "I can't see any difference", she exclaimed. I had to ask her to turn around and look at the smaller and now completely clean bed. She kindly said some nice words about it but did not refrain from drawing my attention to the larger and overgrown bed. Consequently I had to do more garden work when we came home after a long walk. My middle name is changed to "Gardener". I had planned my day from the morning (ie. around 10.30 am), and one of the points was mowing our lawn. It's a strenuous discipline, and I hesitated a bit, but had the edges trimmed, though. Then, to my great joy, youngest daughter + eldest granddaughter came to see us. And again to my great joy the sweet child (18 years) offered to mow the lawn for me. It is the first time in my 43 years at this address, I could sit down while the lawn was mowed, quite a pleasant sensation. I can recommend this "method" to all peers. How long time yet will we have to put up with it? Why do we have to accept winter weather in July? Picture was taken yesterday. What in the world do our meteorologists think of? They should be smarter. But now my patience has run out, and I must insist on getting the whole crowd of meteorologists sacked. They are not worth anything. It is time for us to employ the Italian meteorologists that I have wanted it for many years. Enough is enough. Just look at the weather forecast in Tuscany. It is eminent. And there the ground is not covered with some white stuff that normally tends to show up in the winter. I've been out to find my snow blade and ordered winter tyres at my mechanic's. During the 43 years Matron and I have resided here at our address we now and then have had some rain, but never like today. It was a veritable deluge. 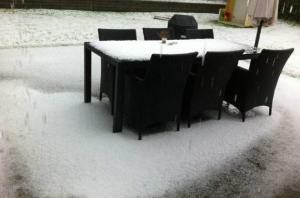 In less than twenty minutes we had 22 milimeters, a genuine cloudburst. The meteorological definition of cloudburst says "more than 15 mm rainfall in 30 minutes." So it was a genuine cloudburst that struck us. This meant that we could not get into my workshop without having to swim. See left picture. 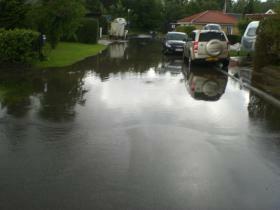 Our little road was a torrential river and sewers just couldn't take it. Neither could I. And down at the bottom of our garden a couple of ducks are swimming around. Very soon I'm off to empty my workshop for water. That's no laughing matter. Pictures are taken when rain had stopped. It is completed. My goal has been reached. 500 kilos of cobblestones are in place around the bed in our front yard. It is one of the hardest jobs I for years have conducted. First the 500 kilos had to be lifted into the wheelbarrow, then lifted down and placed in their proper place. So in reality I have handled 1000 kilos. But I think it has been worthwhile and I am sure that everyone who sees it will bow in reverent admiration for the end result. Matron was the first person to express her devout enthusiasm. And that alone made me happy. I have heard that there is no real summer north of the Alps. 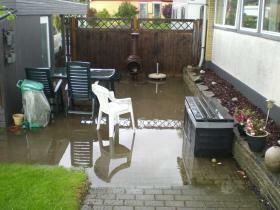 Anyway our small kingdom, Denmark has had its fair share of rain. In fact it rains every day and temperatures are a modest 15-17 degrees celcius. According to some people it's as bad as when Noah went on his cruise with a male and female of all species. As shown on the photo, it's all about placing a number of old and heavy cobbles, each weighing between 5 and 10 kilos, around the edge of the bed. So far I have placed 25 of them which means I've shifted about 1/4 ton of stone, and I still have to shift about the same number to be placed along the edge you cannot see. Before placing the heavy stones I had to dig up some turf, a significant effort which in connection with our walks and bike rides makes my fitness slowly increase. Matron has, to my great joy, expressed her satisfaction with the project in our front yard. It's been a good day. 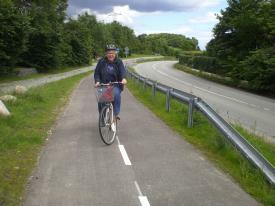 Matron and her obedient employee together made a bike ride (7.5 km.). Before start she confided to me that since she is not too keen on riding a bicycle, she did it only because she loves me so much. That pleased me. Our destination was a farm shop not far from here. Here, we supplemented our vegetables, especially with my favourite, peas. Maybe she loves me tomorrow, too, so we can make another bike ride. It should be added that this morning we walked almost 4 km. So we are quite active. Since we were only the two of us on the ride, it was difficult to take a photo with both of us on it. But I think they should be included as evidence. "Daddy's boy - and daddy's fish." The proud father of our youngest grandson is a keen angler, so keen that he last night got up at 1:30 am. and at 3.00 am. was ready with his fishing rod at a river up north. In my opinion such an act requires a certain amount of madness + a little bit more. I can't believe it. Getting up early in the night and start fishing in the middle of the same! However I have to remind myself that many years ago I did exactly the same. After the proud angler's return with a big salmon both Frederik and the fish had to be photographed. Frederik is 64 centimeters long and weighs 6 kilos. The fish is 59 centimeters long and weighs 2.75 kilos. This picture speaks for itself, I think. Unfortunately I have stopped biking for a period. I am totally out of form. But I shall come back. I must get fitter. I am already on my way and have used my exercise bike lately plus longer and longer walks in Matron's pleasant company. She may even join me on some bike rides, too. In fact I had my first, short ride today, the first one since the end of May. 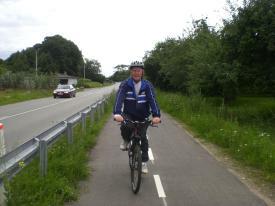 It was not a long one, just a ride round the village, 2-3 miles. But it was a beginning, and a nice one. Hopefully more will follow soon, weather permitting. "You should wait until tomorrow with your bike ride. Meteorologists have promised dry weather, which means that it will rain." But they thought they were smarter, did not listen, and started out. I hope this will teach them to listen to me next time. Garden tools are not my hobby - but by me regarded as a necessary evil. Due to an "edge" project around a bed in our front garden I had to visit no fewer than 3 major DIY stores to purchase a small cultivator only 15-20 centimeters wide. It must be a popular item since, as I said, I found it only in my third attempt. I think that DIY stores should do something about this so that an elderly gentleman does not have to spend most of a day buying an ordinary garden tool. Now it would be tempting to describe my "edge" project in detail. But I'll wait till it is completed. It may last a while, though. I have to jump in and out of the house between the innumerable showers. But look forward to an captivating description. I have a weakness. I have several, but let us initially concentrate on one. Peas. If someone leaves a bag of peas in front of me, I will - as today - without any regrets empty it. I shall not stop until the bag is empty, and I only share with others at gunpoint. We pea lovers are characterized by great selfishness. And today's reading on Google about this lovely vegetable made ​​me even more fond of it. It turns out that peas are a goldmine of proteins, vitamins and fibers - and with very few calories. And the fact that the pea is one of the oldest crops humans have grown (10,000 years) makes it even more interesting. But remember that peas should be eaten freshly picked. Today Matron wanted to explore new hunting grounds. So instead of our usual tour of our 4 local supermarkets the sweet lady wished to visit another one about 7 miles away. Her humble slave took her there in her car. In the shop I at once changed to my famous "super market position", also named "the penguin-walk" and obediently followed Matron two paces after her. Within approx. 3 quarters of an hour we were through the less than medium sized shop. When finally having reached the pay line I started looking forward to a quick drive home followed by lunch. But no, no. I had completely overlooked the fact that we would pass close to a different and much larger supermarket. So lunch was delayed by yet another "penguin walk". On the 25th of May this year, I gave a touching account of my need for breaks in almost any physical work I do. Progress has been made since then. Today I mowed my lawn without the mandatory two breaks. I just carried on. I'm a tough, old boy. A) My general fitness has improved (how, I don't know). B) I had to finish latest at 12 o'clock when The Tour de France started on TV. There's an explanation to everything. Oh dear, oh dear. 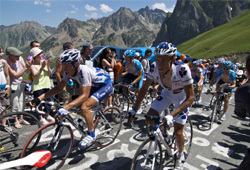 I was had a shock when yesterday afternoon I was watching Le Tour, and in a moment of awakeness witnessed a mass crash. Never have I seen so many riders at one time lying on the asphalt and in ditches with smashed bicycles around them. A lot of blood was to be seen, 13 riders had to abandon the race, and even more went on with abrasions and torn bike shorts. A single rider nearly without any. I am pleased that I said no to participating this year. This mass crash, however, brought memories back from the crash I had exactly on September 22nd 2010. The incident is clear in my memory, dramatic as it was. And just in the center of Aarhus. Fortunately I did not lose my pants at that occasion - just a bit of dignity. By popular demand (at least one) I will now tell about my potato field. It is well and has enjoyed the latest days of sunshine. Only about half the plants are dug up, the rest awaits. Late afternoon yesterday, I took a single plant and only rarely have I seen such beautiful potatoes. They bulged from tastiness. The professional potatoe-farmers can learn a lot here in Studstrup. I expect many questions from them on my website or my facebook. My fee will be modest. 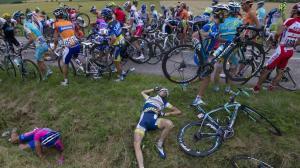 On this sixth day of The Tour de France, I have to admit that I took a serious nap during today's stage. In my little notebook I noted that I was absent for 1 hour and 3 minutes. Not good. But my excuse is that it was absolutely necessary. Luckily it was mid-afternoon, and right now I'm ready to watch the final, I hope. It's a shame to miss out on so much. I must try to improve my fitness. How embarrassing can it be? I do not know, but today it was close to being very embarrassing. During a visit to a store I - as always - brought my plastic water bottle. I walked around in the store, occasionally taking a sip. I carried a shopping bag in the same hand and was aked by Matron to carry yet another one. So there I stood peacefully watching life around me when suddenly the lady behind the counter shouted something at me pointing at my left leg. I did not quite hear what the sweet lady said, but simultaneously noticed something wet running down my left leg. I feared the worst. Had I really had an "accident" in the middle of a store without noticing it? Fortunately not. It suddenly became clear to me that I unfortunately had turned my water bottle upside down, and its contents was now distributed down my leg and also on some items standing on a low shelf. Relieved I apologized and we left the shop. Eventually I had it fixed. My mailbox which on postal orders is placed at the side of the street has been somewhat unsteady on its pedestal ever since New Year when it was put up. 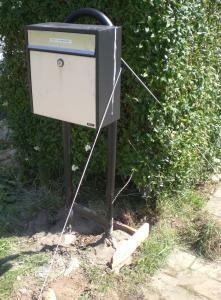 Several people have argued that a mailbox as unstable as mine is a disgrace. I have several times thought of mending it, but not until today it was done. Without expert assistance of any kind I dug out and elevated the concrete base. As the picture shows it was done in artistic ways. Note how the concrete sidles up the metal stud in a cone-shaped beauty. I shall finish the job tomorrow when the concrete has solidified. My confusion is unstoppable. Today I read in two different online newspapers about healthy drinks. I am confused. It is directly against my basic knowledge. A) New research shows that you become healthier by drinking coffee. This must of course mean that coffee breaks are health breaks. But as always the key word is "moderation." Max. 4 small cups per day will protect against heart failure. So there is no need to invest in a thermos. B) Beer is made from hop. In hop is a vitamin that can strengthen your muscles and prevent obesity. This must mean that I - in good conscience - can "warm" up for football matches with an extra pint since researchers claim that beer makes me stronger, leaner and altogether healthier - and smarter. But once again: Moderation, 3 glasses a day. I shall have a problem if it has to be every day. On this most holy Sunday, I was asked to participate in an "excursion" to a shopping mall. It is usually not an activity that I enjoy a lot - and in the middle of the Tour de France season. But it actually turned out to be quite nice. Admittedly, I had to take part in a visit to a supermarket only to review the items, I also observed at all previous visits over many years. But despite all this I found the visit to the center quite nice, probably because our daughter and two eldest grandchildren were there, too - and we ended with a visit to a Chinese restaurant. I've always had a weak spot for Chinese food. It was all in all very nice - and tasty. Thus on this first day in July 2012 I had to recognize that a visit to a giant shopping mall can be nice even for an old mall-hater. So here he sits, the old man. During the morning (rather late morning) I mowed my lawn, TV is turned on with the Tour de France as the only issue (time trial), and our well known and very good commentators have all predicted that it is certainly not going to become a boring race this year. But now I am going put up my feet, almost to a vertical position, relax after the mowing and a lovely shower, study the individual rider - and doze off when and if it becomes necessary. It can no longer be a secret. 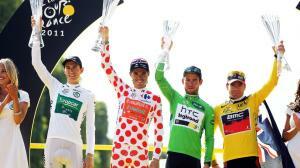 The Tour de France will start tomorrow. I've been looking forward to it for a long time. Now all Matron's order notes will be swept away so that I have all afternoons free for "other activity", a very exalting one, watching TV. I know very well that I may doze off in between during the flat stages, but I am 100% awake at the finishing line, just as I shall follow every mountain stage from start to finish. This is a statement of intent made ​​the day before it all starts. It annoys me a bit to read in today's newspaper that we must expect to be cheated in the our supermarkets. That is if you do not check your receipt. Employees acknowledge that you often do not get the discount you were promised in the newspaper or on price tags in the store. It has been investigated and found that in the past month month 52% of all receipts were not correct. I think that's a lot. But I take it easy. I know that Matron meticulously studies the receipt before we leave the store. However I do have some sympathy for the busy staff. Of course they may "miss" a price now and then. And the trouble checking the receipt is not that great, and I've never experienced that an error was not recognized by the cashier. This picture needs no comment. So I won't give any. In this world very interesting knowledge can be found. And I think we humble geniuses must share it with others. Read below. In some cases I have a little difficulty getting my socks on in the morning. It can develop into a sort of battle between short arms and long legs (or vice versa). A deep breath can bring my socks near my toes, but sometimes no more than that. And there I sit in my helplessness - but still ready to fight on until the operation succeeds. Every year 14 Englishmen break their toes in the context of taking socks on. It's not nice to think about, is it? Who will be next, I wonder? And could it not just as well be me, although I am not English? Yes, it could. Terrible thought. With sorrow I watched England's exit from the European Championships last night. And I don't care whether they deserved it or not. I would much have preferred England to go on rather than the Italians. No matter who played best. Well, never mind. The Germans will win anyway. Football is a simple game that always ends with the Germans winning. A great and wonderful day. The latest addition to the family tree was baptized. Frederik Hegelund Fosgerau became his full name. He had a good day together with his many guests, enjoyed it all including his own "Take-away-lunch", and was very impressed by the myriad of gifts he received. A lovely day not least to grandmum and granddad. This picture is a fake. 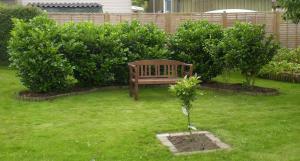 It shows a smiling and relaxed, elderly man sitting in his garden on Matron's new garden bench. What the picture does not show is that behind the smiling facade hides a volcano of pain. He had just finished trimming his hedges and collecting the twigs. Exactly these two activities are no good for a 71½-year old man's hips. They shouted to him that they would not tolerate the many times "up and down" with the trimmer. But the old man told them to keep quiet for which he subsequently has been severely punished. The elderly man has taken 3 pain killers in the hope that they can make the pain disappear. He is stille waiting for the result. PS: It will please many more than I that my cycling idol Martin Mortensen also has been credited 1 minute on the race yesterday, so he ended up as number 9. It's always good to be in top-10. I always get annoyed when a goal is allowed even if it's a clear offside, and everyone can see it's wrong. But this is nothing compared with the fury I feel today caused by a result in a bike race. Last night I attended the Danish Championship in timetrialling and saw all top riders start and the best of them reaching the finishing line. It was very exciting. However I was a bit disappointed that my idol, Martin Mortensen "only" finished at about number 10. But that's cycling. There is only little difference between the best riders. I consoled myself with that on my way home. But then today, it turns out that there has been problems with timing, so much so that one rider was credited one minute. 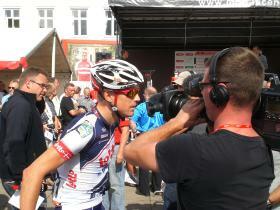 It happened to be the local hero, Chris Anker Sørensen, and good enough for him. But what about the others who feel that their time was also wrong? Martin for one does not understand from where his time comes. The riders can of course roughly chech their own time on their bike computer. This has made me furiously mad. I do hope that something will be done about the apparent error. 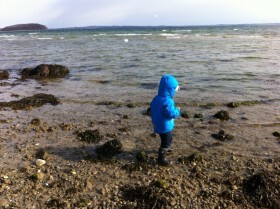 (Photo of Martin en route taken by eldest granddaughter, Katrine). "What do you see in the picture?" It may help you to know that it cost 10.000 kroners, it was put up here in our very house yesterday, and it has a size of approx. 30 x 40 x 15 centimeters, and you can't live without it. 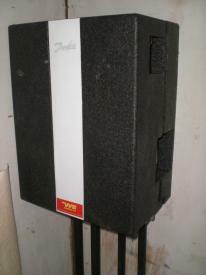 It is a new heat exchanger. If you are unsure of what kind of a thing that is, I shall explain: "A heat exchanger is a device designed to efficiently transfer heat from one medium to another, separated by a plate/wall as the two media should not be in direct contact and thus cannot be mixed." In other words, it produces hot water. That's the "thing" we got yesterday, and that's what it takes to make a married couple live together in complete harmony - and that for a measly 10.000 kroners. And it replaces a huge watertank with 150 liters of hot water. How could one be so foolish to have a big monstrous thing like that installed in 1985? Or was it 1988? Anyway. Now it's gone and has left a bit more space in our utility room. 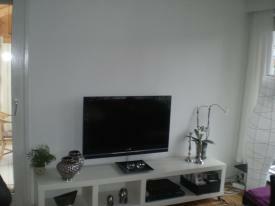 For 10.000 kroners' more space. Today I visited my good friend, Niels. He, like myself, is very keen on bike racing, and his son-in-law, Martin Mortensen, is a professional and rides in the top class, right now for the team Vacanssoleil. I've met Martin once, very nice young man, and he has repeatedly sent me small gifts of drink cans, backpacks, bars, etc. Also this time there was something good for me. 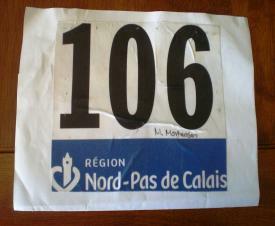 I was given the number sign (with autograph) that Martin wore when in april he was in the notorious race "Paris-Roubaix" with all the cobblestones.One of the big and traditional races. I am very proud of the sign which will now be framed and placed at a suitable place where everyone can envy me. 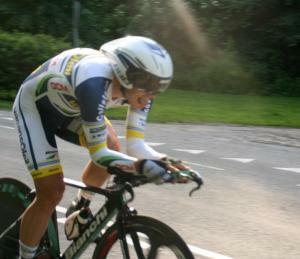 Tomorrow Martin runs in the in the Danish championship in time trial, and Sunday in the big road race of about 200 kilometers. Both in Hammel. I plan to attend either of them and will support him all the way. Last night during a break between my many jobs I sat quietly with our computer playing "Bubble Shooter". Suddenly I heard Matron's ominous voice from the kitchen, "Gunnaaaar. Come and see!" I got rid of the computer and hurried out there. Accusingly the sweet lady pointed at the dishwasher, "It doesn't work!" I realized she was right, and I already saw my bank account stripped.I pressed some buttons - in vain. I checked a fuse group. All 3 fuses were OK. And the stupid dishwasher was useless. Back at the computer I started looking for favourable bargains on dishwashers. There were none. And, alas, once again the ominous voice was there, "Gunnaaaar. Come and see!" Again I hurried to the kitchen. Now it was the stove that didn't work. Whew. It was terrible. Dishwasher and stove both to be replaced. Would be at least 10.000 kroners. But then suddenly it struck me that it could not be just coincidence that both "machines" ceased to function simultaneously, and another look at the fuses showed that one of them in fact was gone - but in a different group than the one I first checked. A quick replacement, and everything worked again. That made me sleep a lot better than I could have. When I was a boy time after school was quality time. Just the other day we talked to our grandchildren about what we as children did in the afternoons and evenings. Great was their surprise, when they heard that we were always outside playing, always. School bag in, a couple of sandwiches down - and then out. We were back at 6 pm. for dinner, then out again and back at bedtime. They obviously had never heard of such a thing. We had a lot of friends to play with, and none of them possesed TV, computer, play station, etc. We played. Where I lived we had lots of woods and the river. One of the pleasures was to walk a short way along the river and be ferried across to a park. It did cost, but sometimes we did have the small amount needed. In the park was an ice cream parlor and a mini-golf course. We never had money for those, but if we were lucky we still had a small coin left for the return ticket and could once again be rowed across the river by the kind, old man. Otherwise we had to walk the long way back through the town. But the ferry ride was the highlight. It was worth every penny. 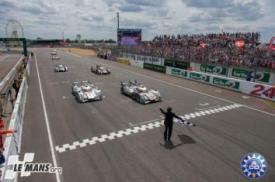 Today the traditional 24-hour car race, Le Mans, was on. It has never really been my cup of tea, mostly because I have not fully known rules and conditions. But as it happens our daughter-in-law is an incarnated Le Mans fan. She more or less watches all 24 hours on TV. She and her family (including Frederik) visited us today. We all followed the race on TV, and she told about the somewhat complicated rules and about the way in which the winner is picked. Also, I learned about the 4 classes that run, and suddenly it became exciting to watch. I raged when Danish driver Tom Kristensen lost his opportunity of winning for the 9th time because of a co-driver's foolish handling of their car. And the speed is high, you know. During the 24 hours the best cars reach nearly 5,500 km., an average of 229 km. per hour, including pit-stops for refueling, tire changes and repairs. I shall have to be careful with my accelerator foot next time I sit in my Toyota. I have two speeding tickets on my conscience. I certainly had an exciting night last night for once watching a football game from start to end. Of course it was England vs Sweden. Even if I have nothing against Swedes I must admit that my "English minded heart" was pleased with the result. What a game. 1-0, 1-1, 1-2, 2-2, 3-2. But was it really necessary to go through all that excitement to reach the end result? I think not. I could easily have done without it. It was a real cliff hanger. Well done, England. Looking very much forward to your next game. But don't let Rooney in. Right now I'm sitting watching bike racing on TV, "Tour de Suisse," while writing on my computer. My eyes change from media to media. But no problem. I can multi-task. If need be I might also be eating a nice whipped cream cake simultaneously. But I do not - it's not healthy, multitasking, that is. Several people are proud they master the art of multi-tasking. But they shouldn't be. Only today I read in a magazine that our brain is not designed for multitasking. If we still do it we might damage it. The only thing we get better at is being distracted. Many neuroscientists, psychologists and doctors have investigated the matter and their findings suggest more and more that our brains simply can not handle this challenge. But who will be the first to admit it, "HELP. I can't multi-task"? Eventually the day arrived - the day when my potato harvest began. I very well know that one on a small island not far from here they started earlier, they always do. But according to a very credible source, an admittedly somewhat aging person from that island, they have already eaten their harvest. Probably they did not have many. However, I have a lot. Today the first of 26 plants was dug up. 14 well shaped potatoes was the result. Multiply this by 26 and you will find that I can expect a total of 326 potatoes. Since I have a sneaking suspicion that 14 is a minimum figure for each plant, I expect well over 400 potatoes in total. If I have a toothache I visit my dentist, if my car fails I visit my mechanic, if my dishwasher strikes I visit my electrician, and if 'my' computer makes problems (which it certainly has done the last couple of days) I visit Torben. I did that today. The computer that Matron in her fantasy calls hers had some heavy problems. It would not turn on. It would not charge. E-mail had disappeared. 2) I got a very nice lunch, composed by the sweet lady of the house. If 1) or 2) were best, I do not know. I would hate to have missed either of them. But food tastes extra good when your computer is working. It is as if life stops when it goes down. Terrible thought. But such are realities in the digital world. I know a very nice village in Surrey called Godstone. I like to be there, also because they have a smashing pub in "The Bell Inn". However history proves it has been quite difficult to find a name for this lovely village. Eventually it seems that everybody has settled on Godstone. By the way. Not far away, funnily enough a bit to the south, is South Godstone. I also know that place quite well, a quiet village inhabited by some by strange people. Well, I just thought that it has been quite a while since last I brought a photo of Frederik. So here is the latest one of them, taken yesterday. Also you can see Matron looking very happy, not yet thinking of all the orders that she later gave me for today's work. I tell you. It has been a nearly unbearable morning. I have already applied for another job. But Matron will not let me go. Wonder why. Could be my very low salary or the fact that she has taken complete 'responsibility' of my VISA card. Today I have had ample need of my otherwise poor ability to swallow a tough one. And even quite a large one. During the time up to The European Football Championships, I have not spared others. They've had to listen to my candid opinion about a miserable Danish national team without skill and determination. I expected the team to face a real hammering against Holland and that they would not get just one point in the 3 preliminary matches. And what happens? They comprehensively beat Holland 1-0 and already have 3 points. To this I can only say, "My goodness!" Usually it is not nice to admit a wrong prediction, but this one I may just live with. However. In our next game against Portugal, we shall get 'murdered' - definitely. 2) Beer makes you stronger. 3) Beer makes you healthier. 4) Beer makes men wiser. 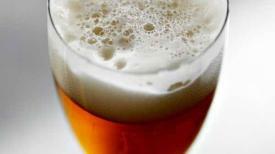 5) Beer strengthens muscles and prevents obesity. 6) Beer can prevent diabetes. All in all impressive news presented by researchers from the University of Illinois. It must please many beer-drinking football fans - and Carlsberg. I am more indifferent since I hardly drink this otherwise excellent brew any longer. Had I only known in my younger days. It has not escaped my attention that the European Football Championship will start today with a very interesting match between Ukraine and Greece, yawn-yawn. Tomorrow, Denmark plays against Holland. Whether this game will also be yawn-yawn, I could not tell. But I know that at least the Danish goalkeeper will not be bored. He must continually retrieve the ball from the goal. Well, never mind. This is not my errand. No. I would like to express my extreme distaste by seeing the many tattoos that are presented by today's well-known footballers. It seems that you can not have just a tiny contract before you throw yourself into the chair at a tattoo artist. And preferably the entire upper body must be covered. Not only does it look awful, it is also dangerous. The chemicals you get under your skin, you have to live with for life. May I instead propose that each player uses a peaceful skin-painting used in kindergartens. Then he can make with a new "tattoo" for each game. Today I have sinned against good nature- and environmental policy. I have sprayed - and that even with some new and very toxic stuff. I can no longer manage manually removing weeds in the thousands of spaces between the small tiles that we have so many of. Consequently I have turned to some fluid and toxic anti-weed-substance. And it is strong - so strong that I shall not be surprised if also the tiles are gone when I wake up tomorrow morning at 10 o'clock. I can clearly hear environmentalists raging over my spraying. They do not like it. But I have to tell them that if they want manual weeding here on my plot they will have to come and do it. I can't. And then they can mow my lawn now they are here. In these difficult times of crisis you have to save where you can. I try to turn each coin before I spend it, but thanks to the VISA card they easily disappear. But then yesterday I found a saving object that is simple. I love yogurt, of course the sound one with strawberries. Fruit is good for all of us. But it has for a long time irritated me that I could not get all of the youghurt out of the carton, no matter how hard I shook it. I could feel that still a half platefull was left in there. Take a pair of scissors and cut the yogurt carton in half, and voila, with a spoon you can get hold of all the yoghurt you paid for and which was previously thrown away. Just remember that the lid must be on before you turn upside down on that half. The idea is herebye communicated - for free. This website is educational, you must admit. PS: You do not have to do the same when there is milk, orange juice, apple juice, or cream in the carton. I get in a good mood by hoeing potatoes. But I get in a bad mood by thinking about the weather we are having. It has been very windy for more than a week, and I am very much against it. I'm getting to the point where I prefer rain rather than wind. And even worse. The forecast does not promise any change. Moreover, it is cold like on some desolate rock in northern Norway. And is anybody doing anything about it? Could not we be blessed with just a tiny bit of global warming? It is my impression that it is only in the polar regions that benefit from it. And there the wind is even worse. I am more and more in favour of the idea that living north of the Alps should be banned - and I love spaghetti. For inscrutable reasons I have forgotten to tell you about a small experience I had last Saturday. But now it must out. It took place at a parking lot of a supermarket. After a heavy purchasing raid with Matron I stood waiting at our car. Suddenly, out of the blue, a car whizzed past me at high speed, through empty spaces between parked cars and close to the shed with trolleys. The car was brought to a sudden stop at an empty space opposite. Out came a lady with two young children. I could not resist and said to the speed-loving mother that if a child had suddenly come out between the cars or from behind the trolley shed, something terrible would have happened. That she obviously did not like to hear. She stood a few feet in front of me, breathed heavily and stared very angrily at me. Just kept on staring. For a moment I thought she would attack me physically. I stared back and said quietly, "Yes, you did go very fast." At that her voice came back. When she saw that I was not driving, but as so often before had entrusted this to Matron she snarled at me, "I can see that you are not driving. Perhaps my reactions are better than yours." I did not comment on that but went into our car. It was my clear impression that she did not like me - and that her conscience wasn't all that good. When former school principles meet there is no need for an agenda. Today I experienced a joyful reunion with former headteachers and vice headteachers, former colleagues from Aarhus. We are a group of 15-20 people who meet at a fixed annual event with a nice lunch. When we met in the old days in an official capacity at headteacher meetings we always had a tight agenda, which was observed. This was not the case today. And let me tell you something. Former educators can talk. Of course it was mostly down memory lane, happy and sometimes sad events that we experienced many years ago. Also other colleagues and former students were subjects receiving space. Who can forget the story about the teacher at a school who one winter's day was hit at the back of his head by a snowball, thrown by one of seven students who were standing behind him. The teacher lined up all seven and asked them one by one: "Was it you?" The first six of them said no. Number seven was not even asked. He got a slap on his head that sent him into the snow while the teacher exclaimed: "Then it can only be you"! I have but few golden rules for living. However I've just got a new one, "Do not clean between tiles with a pressure washer in an attempt to remove weeds." Tuesday 22/5 (see diary) I did it and was messy and muddy on my entire front. Yesterday Matron observed that I had also "mudded" our garden furniture and cushion box. This did not go unchallenged and therefore on my work sheet this morning, among other items, it said, "Wash garden furniture and cushion box." It is an exhausting and enervating task when before that I had vacuumed the entire house, and done the beds, and cut grass edges in our front garden, and weeded and swept our driveway, and weeded and swept our courtyard, and emptied our dishwasher. Consequently I shall permit myself to keep the rest of the day off, at least till the sweet lady returns from work. I have a tough little brother, 5 years younger than me. He has outlived the dream that I had for many years as an ultimate goal. Last week he rode all the way up Alp d'Huez. How I would wish I could do the same. It's just so tough of him. But I must realize that I have to set myself smaller targets on a bicycle, such as cycling from here to Moesgaard Beach and back, 50 km. quite accurately. That in itself for me is about equal to his exploits up the steep mountain with the 21 hairpin bends. I would be just as exhausted. I have to console myself with the fact that my trip will be 37 km. longer than his trip up the Alp d'Huez. I'll tell you about it if ever I reach my goal. 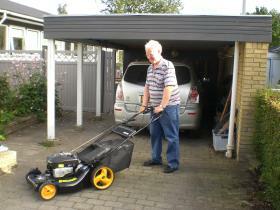 Mowing the lawn is a good and Christian deed that does not require high brain activity. To push around with the stupid machine is a simple task for we humble geniuses and gives plenty of time for reflection. During today's 'pushing' I reflected on how I would get fit enough to manage the high amount of major sporting events that TV will offer us this coming summer. 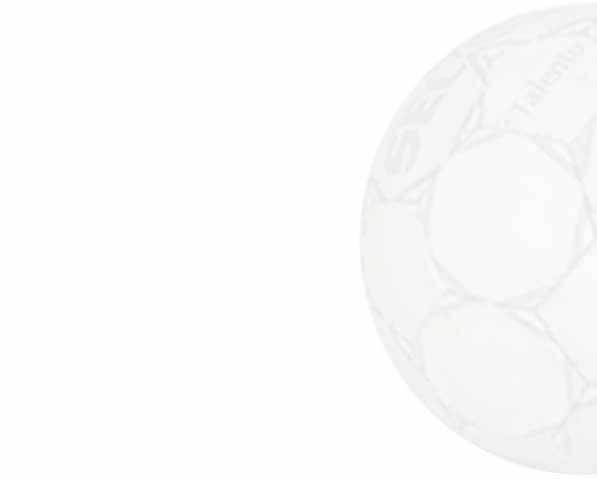 It starts in about a week (8th of June) with the European Football Championships. Then follows tennis from Wimbledon 25th of June. After that we shall have this year's great experience, Tour de France on 30th of June, to finish with the Olympics from London on 27th of July. It will be a very busy summer with only very little time to mow. While Matron this morning went on a major campaign in nearby supermarkets and among many other things bought 5 kilos of tenderloin, it was my lot to weed and hoe our extensive potato fields. It is an enjoyable job that puts me in a good mood, not least due to the high expectations for the harvest and the lavish subsidies from the EU. Certainly my experience with the latter is not positive, since during the previous two years I have not managed to squeeze just one penny out of the system. But this year I shall succeed. 26 plants up out of 26. It must pay off.